That's a photo which I took yesterday. The Moon was low and clear and bright, it was begging to have its photo taken. As you can see in the gallery here it took me a few attempts to find the right settings on my camera to properly capture it. You could even be excused for thinking it was the Sun in a few of them. Edit to add: Writing this post made me look out of the window and it's very much the same tonight, except it's later and therefore darker. So I took a few more photos which you can find here. 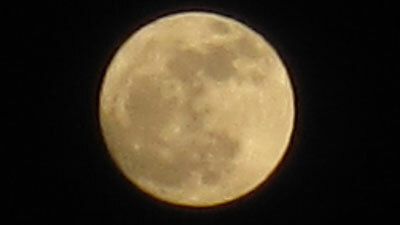 Magnificent, that is as good a photo of the moon as I have ever seen anywhere, well done. It's full tonight of course, and apparently, due to a solar flare, some people in UK may also be able to see the Northern Lights. But probably not us city dwellers, unfortunately. Still, I'm going out to have a look, just in case!